Traveling to the US and want to avoid high roaming rates. Ready SIM recently announced the release of new Data Only plans designed for travelers to the U.S. or anyone in America that needs short-term data access for their unlocked smartphone, tablet or hotspot. Available on a self-activating SIM Card, the Data Only plan allows people to use a nation-wide 4G data network without signing a contract or providing any personal information. Wow! 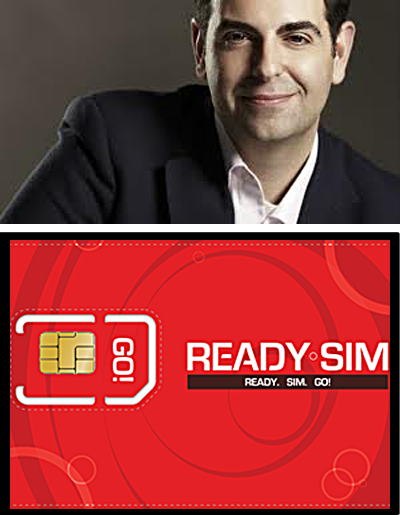 We talk with Emir Aboulhosn, CEO of Ready Sim about this new plan. "ReadySim is a unique product in the industry, it is the first self-activating SIM card that has been developed in the US. The secret behind it is that we remove any dealer-assistance or any retailer involvement in the process." "...you simply take the sim card, put it in your phone, punch in a 5 digit zip, send it by SMS and then you get a local number and you are ready to go"
"The security comes by the byproduct of how we designed the product itself. First of all, if people are looking for some extra level of privacy, the process is self-served and the SIM card is ready-to-go when sitting on the retail shelf. It is not activated in advance but the user has to activate the card by punching in a 5-digit zip. Other than that we don't take any user information so we don't take your first name , last name or credit information." Traveling with portable devices like your tablet makes Ready Sim a winner in my book. Especially if you have a mobile enable table with WI-FI. Let's face it. Many of us use our laptops in WI-FI mode to save in data costs so this product is a boon to people traveling outside of their local area on an Mobile-enabled Tablet. Check it out, it seems safe, secure and inexpensive.